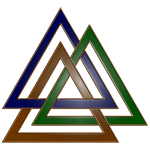 This Valknut design was inspired by several hits on my website looking for Valknuts after I mentioned them in connection with Trinity Knots. 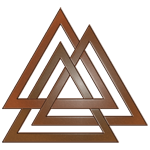 The Valknut is an interesting knot: it can be formed from three triangles of metal (or paper) intertwined: the top one goes over the bottom, and the right goes over the top and under the bottom. It is associated with Odin and the religion of Asatru. Other names include Odin’s Knot and Knot of the Slain.